Driving in the winter can be quite a challenge. If you’re like most drivers, it’s likely that your car isn’t prepared to handle the harsh roads that winter brings us. Even the lightest of snow dustings can cause your vehicle to lose grip of the road and slide out of control. On top of that, the exterior of your vehicle may suffer greatly due to the amount of salt picked up from the road while driving. Salt creates an unattractive coating on the paint of your vehicle, which can cause scratches and rust to the exterior of the car if not removed promptly. Winter car detailing is recommended for those who wish to protect their vehicle’s exterior body throughout the winter season. 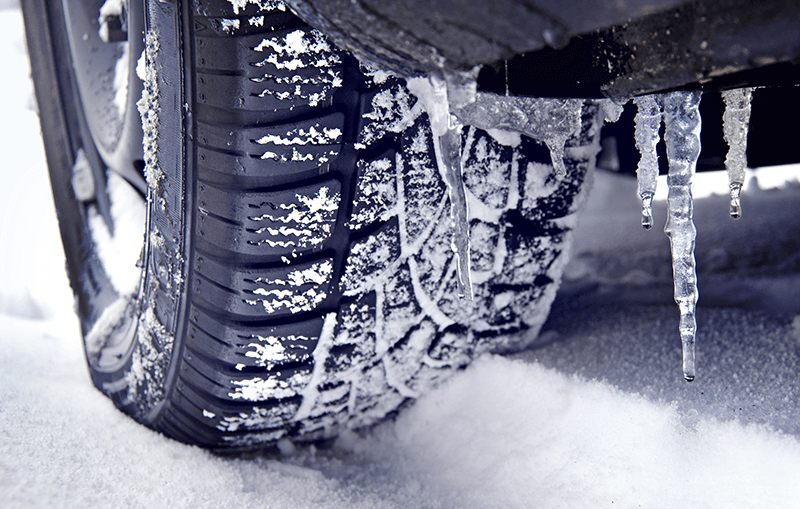 Consider the following tips to ensure your vehicle is prepared for the winter months ahead! One of the most common occurrences during the winter months is the rapid decrease in tire pressure in vehicles. For every ten degrees the temperature drops, your vehicle’s tire pressure decreases by one pound. While a single pound of pressure may not seem to be detrimental to the operation of your vehicle, any decrease in traction could put you at risk. The chance of your tire pressure being low is very high in the winter, and you should verify that your tires have the correct amount of air in them before a taking your vehicle out on the road. You should also inspect your tires for signs of wear and tear, as deflated tires could cause external damage if driven on for too long. Snow isn’t the only weather change to look out for during the winter months, as freezing rain also occurs when the temperature drops. Driving in freezing rain can quickly turn into driving on ice, which is dangerous regardless of your tire’s conditions. However, equipping your vehicle with the best winter tires will greatly reduce your chance of losing control while driving in icy weather. *These prices are only an estimate, as the actual price per tire will vary depending on your vehicle and the tire size it requires. The mixture of both snow and road salt is notorious for dulling your car’s paint and making it susceptible to rust. Take preemptive measures and wash your car with a product such as Pinnacle Black Label Diamond Paint Coating to ensure its protection. When applying the coating be sure to focus on the lower parts of your car impacted with the most snow and salt. Another option for protection is to bring your vehicle to a car wash, as most car wash locations include a protective coating with their wash solutions. Car detailing service may include waxing of the car’s exterior, which will provide your car with the protection it needs throughout the winter season. For maximum protection, it is reccomened you bring your vehicle for a car wash ever two weeks. If you are opposed to using a protective coating and don’t want to spend the money to bring your vehicle to a car wash, make sure to wash your car every ten days. These frequent washes will remove any corrosive slush attached to the exterior of your car. This process is best completed on days when the temperature is 40 degrees or higher during daylight hours to avoid freezing. Much like how snow and road salt affect the exterior of your car, it can also lead to interior damage. Tracking in snow and salt from the bottom of your shoes can stain your interior and even seep through the floor causing molding or rust. It is recommended you use rubber floor mats instead of your regular carpet mats to prevent this from occurring. If rubber floor mats aren’t accessible, always ensure that you knock off any salt and debris attached to the bottom of your shoes before settling into your seat. Vacuum your interior immediately once you arrive home if you notice salt on your car’s interior floor mat. Potentially one of the most overlooked winter car care tips, replacing your windshield wiper fluid with a winterized blend will not prevent your wiper fluid from freezing once the snow begins to fall. You should also check your antifreeze and oil levels to ensure no internal damage has occurred to your car. Windshield wiper fluid is great for melting ice due to its antifreeze properties. It can come in handy when your windshield has a layer of ice covering it and save you a lot of energy in the future. You’ll also want to confirm that your vehicle’s engine oil has recently been replaced. You do not want to be stuck inside and unable to make it to a mechanic due to heavy snow conditions for something as minuscule as an oil change. Since oil slows its progression in cold weather, it is important to have full levels to avoid any internal damage. It is recommended to create your winter emergency car kit before snow coats the ground, as individuals normally go into a panic at first sight of snowfall. This may result in your local stores’ inventory being wiped out leaving you unprepared in case of an emergency. While this option is generally recommended for those already in search of a new car, individuals living in the northernmost part of the country may want to consider purchasing a car built for snow. Most manufacturers will release vehicle models that are specifically engineered with the winter season in mind. Consider these variants over others offered, as even with the appropriate precautions taken and tire modifications installed common sedans and coupes won’t always be able to make it through extreme winter weather. The best cars for driving in the winter can be broken down into three categories: country, suburban and city. Drivers in rural areas will likely require a vehicle that can ride with high ground. Rural areas typically have roads that are plowed less frequently in the winters allowing snow and ice to layer as the winter progresses. The Jeep Wrangler is one of the most trusted heavy-duty vehicles when it comes to rough terrains. Rated 4.6 out of 5 on Kelley Blue Book and priced below $30,000, the Jeep Wrangler is one of the most popular country-driven vehicles that can withstand the winter. Subaru vehicles have always been known for their ability to handle wet conditions. The Subaru Outback was built to handle snow and has a rating of 4.1 out of 5 on Kelley Blue Book. There’s a reason why the Land Rover Discovery is the most expensive out of the three listed for country cars. It can handle more than winter conditions, as the Land Rover Discovery can make it across a small river. It has a 3.6 out of 5 on Kelley Blue Book. Suburban drivers typically drive less heavy-duty vehicles. However, many require a vehicle that will be able to handle their family’s logistics and keep them safe throughout the winter. Despite being a compact SUV, the Honda CR-V still offers enough space for average families and has a build strong enough to withstand a couple of feet of snow. It has a four-cylinder engine with a 28-MPG fuel efficiency rating. It has a 4.8 out of 5 on Kelley Blue Book. The Volkswagen Atlas V6 is a mid-sized SUV. It excels in safety ratings and has an all-wheel-drive (AWD) option for driving in snowy environments. It has a 3.6 out of 5 on Kelley Blue Book. The Volvo XC60 also has amazing scores when it comes to safety ratings. It’s marketed as a powerful vehicle that retains style, space, and more luxurious features. It has a 4.4 out of 5 on Kelley Blue Book. Urban drivers require cars that are easy to park and have great fuel efficiency. Drivers located in cities such as New York City need a vehicle that can make it through poor road conditions, as not all roads are plowed on time in such large cities. The Mazda CX-3 is an affordable subcompact SUV that includes an AWD option on the Touring and Grand Touring models. It has a 4.3 out of 5 on Kelley Blue Book. The Audi A4 is known for being a luxury sedan. It seats up to five people and has an outstanding score when it comes to safety ratings. It’s great for driving in snow and other winter conditions. It has a 4.7 out of 5 on Kelley Blue Book. As the first electric vehicle on this list, the Tesla Model S stands out from the rest by providing amazing luxury features and a decent driving range on a single charge. It has AWD and amazing torque to tread through harsh winter terrains. However, it’s important to note that cold weather decreases the Model S’ driving range overall. It has a 4.8 out of 5 on Kelley Blue Book. The type of car you drive or the precautions you take will mean nothing in the end if you’re not driving safely. Driving in the winter can be extremely dangerous, and each year thousands of accidents occur. Always drive slower on roads covered in snow or ice. If necessary, keep your hazard lights on to let drivers around you know you’re taking great precautions while driving. We’ll never truly be able to eliminate all winter road accidents, but those who drive smart are definitely making a difference.